Without a doubt, the Huawei Mate 20 Pro looks set to be a solid contender for flagship smartphone of the year. But with that potential title comes a rather steep price. 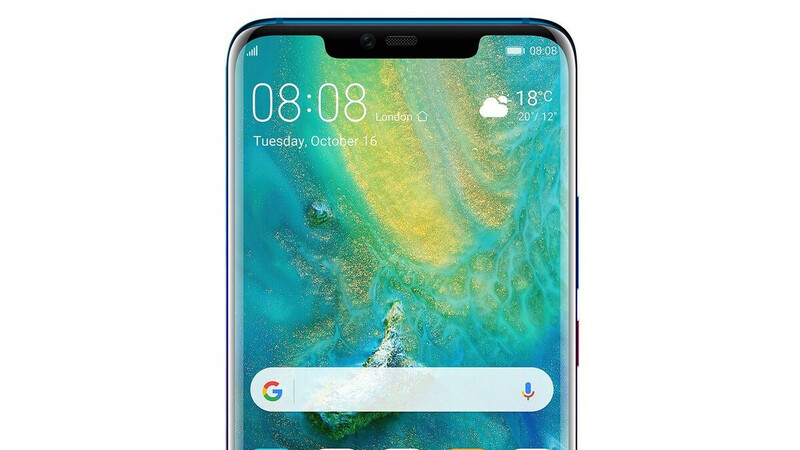 Yesterday, it was revealed that the Mate 20 Pro variant with 6GB of RAM and 128GB of internal storage would cost £899 ($1,180) in the UK, a huge increase over last year’s Huawei Mate 10 Pro and even this year’s P20 Pro which retailed for £770 and £799 respectively. Over in the rest of Europe, however, it seems pricing will be slightly lower. Specifically, the exact same variant of the Huawei Mate 20 Pro is set to go on sale in most European markets at around €999 ($1,150), although some markets may be forced to spend an extra €50 on the smartphone. For reference, the Galaxy Note 9, the Google Pixel 3 XL with 128GB of storage, and the cheapest iPhone XS Max retail for €1,009, €1,049, and €1,259 respectively across Europe. When it comes to availability, Huawei is set to open up pre-orders for its next premium device immediately after next Tuesday’s event finishes. Unfortunately, consumers won’t begin receiving the device until Monday, November 5. Looks and sounds like a great phone apart from one thing: the UX design of EMUI is such a horribly shameless copy of iOS that I would never permit myself to be seen with such a thing in my hand. Phonearena had justly critisized this in their P20 Pro review. Now to add insult to injury is the huge price tag. Sony Xperia XZ3, here I come. Choose another theme, use the app drawer, use widgets; your screen will be completely different compared to iphone... You could also install a different launcher. I believe this is the best phone so far in 2018. You cannot change all the UX elements like that. It gets even messier. Far from having a coherent UX design. Yes, Android is all about flexibility, but that shouldn't mean that the basis can be already a mess. "EMUI is such a horribly shameless copy of iOS" You can say the same for stock Android. Notification shade, the setting app, various UI elements, you name it. People on the internet raged over how strikingly similar Android 9 is to iOS 11/12 when it was first released. But apparently EMUI is going to take design cue from MIUI with version 9.0, so at least it won't look like iOS, far from it. I use Nova Launcher in my Mate 10 pro. Yeah, I admit that I don't like their UI icons but the dark theme for OLED is much better than any other dark theme. Not to mention that you don't have to download or pay for it because it's within the settings itself. Time to buy preceding flagships. after Pixel 3 XL this phone looks like Snow White. The regular Mate 20 looks great with that minimal notch. It's because the people in general are bad accustomed only to the iPhone to be expensive as being a luxury article of fashion and don't think so in relation to the Galaxy top phones. But people have to realize that Samsung and already is time, the people understand and put in the head that top Galaxy phones also are of the same parameter of the same level of the iPhones and now either the Huawei P series and Mate series. Front looks just like the V40, and the back is just a different camera placement. V40 wins this one in my opinion. The problem of the V40 is it's small battery. And V40's isn't as good as flagships from other companies when it comes to camera. Yeah, the top cameras are mostly Pixels and Sammy's S line. The OnePlus 6, Huawei P20 Pro and Sonys are just under them in my opinion. LG comes after with a camera quality of upper mid-range phones but does have potential. That pic is awesome, goodlooking phone, if you dont like the notch sti, we have a choicdeto hide it. If only it come out before i bought my p20 pro.. My first Huawei ph9ne coming from Samsung. I'm heading to China and will get this day one. I like my Huawei phones way better than Samsung, LG, or any others I've tried. Was considering buying, but the price, HELL NO! It feels like if it cost 1000€ why wouldn’t people buy iphone immediately, I mean yes some of us are watching reviews and specs but I think the people that doesn’t care of anything else than “just having the best phone” is always the most expensive one or the biggest brand like Iphone, I have a hard time believing that Huawei is that famous yet for people that doesn’t care to watch reviews and specs. What do you guys think? how much you know about geography? Huawei is a top of the top tech company in Asia and worldwide is innovating with 5G tech. You would be surprised how many people would pay so much for a Huawei phone. Huawei is that famous, yes. A company as Huawei who spend money in new network technologies and in their phones with their own chipsets with their network modems and processors and sell or will sell this year globally as many phones as Apple or almost as many are very famous around the world, you is who is not on pair of what happen with Huawei and in the world, you only live your world in North America, or Germany, nothing more. In europe atleast iphone and sammy is the most popular, but Huawei have been more and more seen these days, but as I said people here Won’t give 1000€ easily to a Huawei phone, they would go then and pay to get the iphone or just buy the oneplus6 that is also really popular here. This is the phone to get if you’re a Samsung fan, but you really want a notched phone. Buenos Notches!